The nine block is a common design pattern among quilters. It's construction methods and primitive building shapes are simple, yet produce millions of interesting variations. Each block is composed of 9 squares, arranged in a 3 x 3 grid. 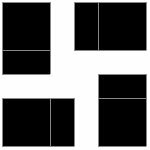 Each square is composed of one of 16 primitive shapes. Shapes are arranged such that the block is radially symmetric. Color is modified and assigned arbitrarily to each new block. 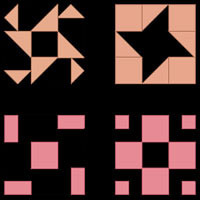 The basic building blocks of the nine block are limited to 16 unique geometric shapes. Each shape is allowed to rotate in 90 degree increments. Only 4 shapes are allowed in the center position to maintain radial symmetry. 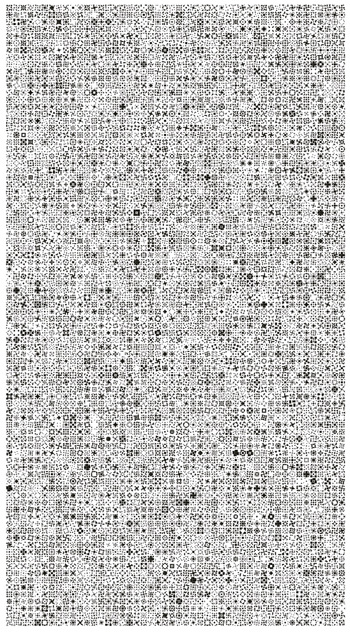 figure B. the 16 possible shapes allowed for each grid space. The 4 shapes allowed in the center have bold numbers. This has got to be one of my favorite permutations simply because of the astonishing results for a very simple set of rules and primitives. If each generated nine block was a physical tile 1" in height and width, I'd have an overflowing cart of them at the bazaar, downtown, this weekend. Many thanks to Karen's Creative Fabrics in Las Cruces, New Mexico for providing the methodology of the nine block quilt.